Dan Rhodes is the Sheriff of the rural Texas county of Blacklin. Its residents are what one would expect—unique, strange, humorous, friendly, and, in a few cases, dangerous. In Red, White, and Blue Murder Rhodes encounters them all, but the most memorable are those who are, in varying shades, dangerous. The novel opens smack in the middle of a midsummer heat wave that has stalled over Blacklin. It is so dry and hot that Rhoades doesn’t need an excuse to keep from watering his lawn, which also acts as a great way to get out of mowing it as well. But even with that small benefit Rhodes is downright tired of the heat and he has the notion of shooting the next person who asks if it is hot enough for him. It doesn’t help matters that the inmates of the county jail are grumbling about a lawsuit because the jail is so hot, and a rookie reporter for the local rag thinks she has him and the County Commissioners cold on a corruption charge. But things really begin to heat up when a local man is burned to death in a house fire that looks like arson. 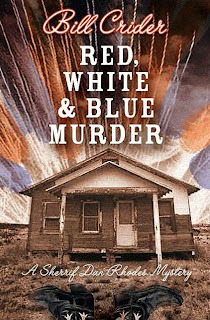 Red, White, and Blue Murder is the first of Bill Crider’s novels I have read and it was better than I imagined. It is a unique blend of whodunit and American style hardboiled—probably something like 75% of the former, and 25% of the later. The whodunit part is the comfortable setting, the townspeople—pestering, conniving, kind, and likable. It is a place the reader would love to visit, and in a literary manner, it is a place you have been before, but not for a very long time. The hardboiled portion is the manner Mr. Crider develops the mystery and action. The prose is gentle, but in a stark and economical manner. Sheriff Rhodes is a strong and independent character who is less than perfect. He plays the stumbling small town lawman routine perfectly. The mystery and action seemingly overwhelm him a few times, but his tenacity, stubbornness and implicit strength pull him through each time. 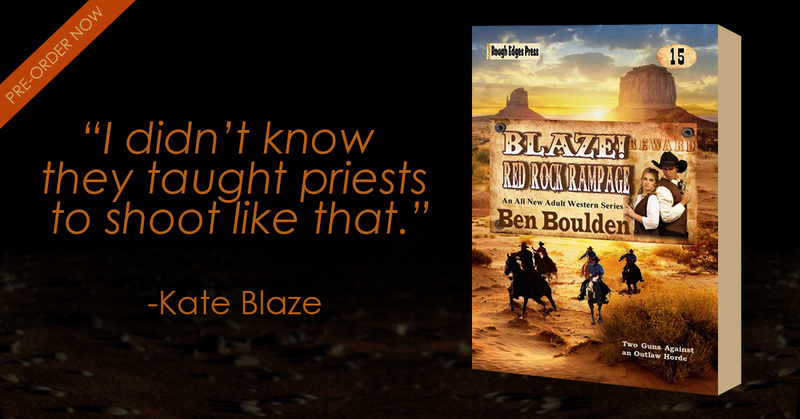 He is the kind of character that keeps the reader involved and invested in the story. In short, Red, White, and Blue Murder is a terrific mystery tale. The story is entertaining, humorous and surprising. The action is invigorating and the setting is pitch-perfect. The characters are perfectly cast in roles that range from the humorous and odd to violent, shady and downright mean. A NOTE: Red, White, and Blue Murder is the twelfth novel to feature Dan Rhodes and there have been three released since (with another due out in 2009), which means Blacklin County is a place that can be visited again and again. This is a review I originally wrote for SFReader, probably something like three years ago, and I've been thinking about several of the stories recently so I thought I would dust it off and give it some new life. It also doesn't hurt that I'm busy right now--we (my employer) just transitioned into a ten hour work day and I haven't quite caught up with it yet. But I do have a few new reviews planned: Bill Crider's Red, White and Blue Murder, and Warren Murphy's The Hands of Lazarus. I'm also reading a terrific little science fiction novel titled Unholy Domain by Dan Ronco. I'll keep you posted, but until then read this one and the collection too. 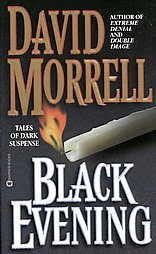 Black Evening, written by David Morrell, is advertised as a collection “of dark suspense.” These stories represent twenty years of Mr. Morrell's best short works. Each of the stories is a departure from his novels in that the focus is on the horror of fear, rather than international intrigue or action. The tales range from the supernatural to the more realistic and each is dark and very frightening. The stories are personally, honestly and intimately, introduced by the author. He explains the story, how it was written and why it was written. The stories stand well on their own, but with the addition of the introductions, the sincere explanations, they seem to take on new life: the life of their author, and very much the life of their reader. Morrell created them, but as you read them they will be yours, exclusively and alone. Black Evening is not for the timid. The stories are rough, at times frightening, and always thoughtful. Each of them pace the life of the author and explore his innermost fears. These fears give the stories a credibility—realism—that is often lacking in American genre fiction. The stories are images of the past, almost postcards from a dark, inner world of torment, anxiety and fear. This collection is a winner. The stories are superb and the author’s insights are well placed and thoroughly illuminating. David Morrell is a master of the modern story, and Black Evening is his primer of dark tales. 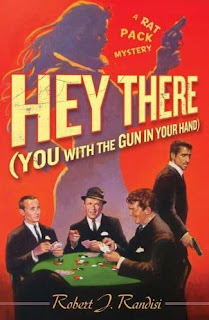 A few weeks ago Robert J. Randisi announced his first Rat Pack mystery—Everybody Kills Somebody Sometime—had been optioned for film and today I went out and found the cover art for the third installment of the series, Hey There (You with the Gun in Your Hand). The first two novels were terrific and the cover art was impressive, and the cover art for the third is just as good, if not a little different. The impression of the girl in the background reminds me of a James Bond poster and I love the image of Sammy Davis, Jr. with the gun in his hand. Hey There (You with the Gun in Your Hand) is scheduled for release December 9, 2008 from St. Martin’s Minotaur. "It's 1961 and Las Vegas is still the place to be. Eddie Gianelli, pit boss at the Sands Casino, now considers the Rat Pack his friends. And this time, his friend Frank Sinatra wants him to help Sammy. Someone has an embarrassing photo of Sammy and wants $25 grand for it. All Eddie has to do is make the pay-off and collect the photo. Easy, right? But at the rendezvous, in place of a blackmailer, Eddie finds a dead body greeting him instead. Pretty soon Eddie and New York torpedo Jerry Epstein are up to their elbows in bodies. There's a double-cross going on. Could the presence of the Secret Service mean that JFK is somehow involved? "In this next installment, the Rat Pack is back in full swing. Celebrity cameos with Buddy Hackett and Marilyn Monroe add to the glamor. It's certain the stars are out, and it's up to Eddie to see that they don't fall from the sky." A little over a year ago I reviewed the novel Threat Case by J.C. Pollock—a writer I devoured as a teenager in the early-1990s—and while I was re-reading Threat Case I did a little research and found a hotly contested pseudonym that possibly belonged to Pollock. The pseudonym is James Elliott and the majority of information around the Internet suggested it belonged to the writer John Case—which is the pseudonym of husband and wife team Carolyn and Jim Hougan. They have written several successful novels over the past decade including The Genesis Code and The First Horseman. Unfortunately I’ve never read any of them, so I can only assume they write a tight and gripping thriller. I have found only one of the James Elliott novels so far, the Pinnacle Books edition of Cold Cold Heart, and I haven’t read it yet. It’s on my stack of “to-be-read” books and I need to move it up a little. Heck, maybe tonight. And I can’t wait to see what his most recent film project turns out to be. My favorites are: Threat Case, Payback and Centrifuge, but all of them are great. 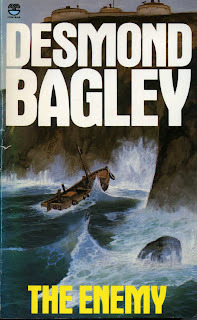 Desmond Bagley was one of the first thriller writers I discovered. I found his terrific novel Flyaway in a paperback exchange as a teenager and devoured it in only a few sittings. I can still remember reading it on a warm August afternoon on the back porch of our house; a gentle breeze in the air and the quiet thrum of classical music in the background. I was in the African desert right along with the protagonist, and I absolutely loved it. I spent the next several years hunting—pre-Internet era—down copies of his other thrillers and while I didn’t find them all, I found enough to know that his work was one of the standards by which all other thrillers of his generation should be judged. Desmond Bagley was born in England in 1923 and spent nearly twenty years of his adult life in southern Africa—the better part of it in South Africa where he worked as a journalist and wrote his first novel The Golden Keel. He wrote sixteen novels, each made appearances on best-seller lists around the world, before his death in 1983. His work was well received from the 1960s to well into the 1980s. Then he disappeared. I only saw the final two of his sixteen novels on the shelves of new bookstores and one—Night of Error—was on the discount rack of Walden Books for a dime. (I also found Joe L. Hensley’s Robak’s Fire, and two The Destroyer novels that day. It was a good day for bargain hunting.) Bagley’s work was wildly popular in its day, but as I write this he is mostly remembered—if he is remembered at all—as a minor writer of the old style thriller: The older and more literate stuff that was written without any bells and whistles. The prose was straight forward and simple without the edge of over-dramatic and outlandish plotlines that have made many modern thrillers nearly unreadable. The thriller genre was dominated, in the 1960s and 1970s, by the work of Alistair MacLean, and Bagley’s work was very much influenced by it and is favorably comparable with the best of what Alistair MacLean produced. 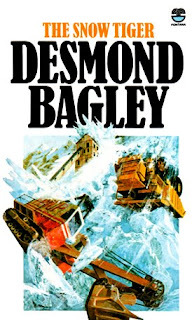 In fact MacLean blurbed Desmond Bagley’s 1975 The Snow Tiger—“I’ve read all of Bagley’s novels. I think he is better than me.” That is a sentiment I don’t necessarily agree with, at least not so far as MacLean’s early work is concerned, but much of what Desmond Bagley wrote was pretty damn good. The Desmond Bagley protagonist tended towards the solitary and ordinary—they were rarely involved with a government or other large organization, but they were always tough, resourceful and capable. In The Golden Keel Peter Halloran teams up with two other men to find a treasure that was found and hidden at the end of World War Two in Italy. Halloran is the ideal Bagley hero for the simple reason that he is an ordinary man who rises to face an impossibly difficult, terrifying and life-threatening situation; a situation the hero solidly planted himself through his own actions. The plotlines are uniquely 1970s—the lone adventurer finding a maze of death, deception and betrayal in exotic locations with beautiful women who often turn dangerous. 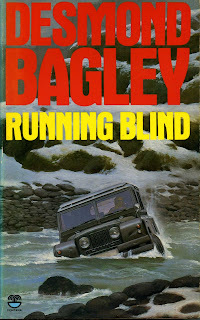 The kind of plots that when done well, as most of Bagley’s work was, launch the reader on an adventure that is larger than life and exhilarating escapist fiction. Flyaway is an example of Bagley’s tremendous plotting—Max Stafford owns a corporate security company and on a whim decides to look into the disappearance of an accountant who works for a client firm. The adventure takes him to the Sahara and across the southern part of Africa in a race to find the accountant before a dark and sinister group get to Max, or the man he is looking for. The prose is unhurried and simple. Bagley did use clipped and short sentences to build tension, but for the most part he builds tension and suspense with plot, setting, and character. An example of his simple style and unrushed prose in a scene that builds suspense is the following paragraph from High Citadel where the protagonist—O’Hara—is being forced to land his passenger liner on a too-short high altitude runway in the Andes Mountains. Desmond Bagley’s stories are similar in both tone and storyline, but he used different methods to tell it. A sampling of his work will show the use of both first person and third person perspective. A few of his better first person narratives are Landslide, Running Blind and Bahama Crisis. High Citadel, The Spoilers, and The Tightrope Men are all in third person, and each of them is successful. He did have a habit of starting novels with the protagonist in bed sleeping past the alarm, but a few repeats are expected and forgivable. The work of Desmond Bagley is worth discovering. 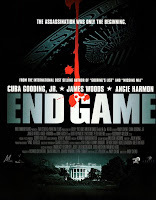 It was influenced heavily by the success of Alistair MacLean and a line can easily be drawn from it to the thriller writers of the 1980s and 1990s; specifically the early work of Tom Clancy (Patriot Games, especially), Greg Dinallo, J.C. Pollock, and even the early work of David Morrell. Its roots are firmly planted in the traditional of Geoffery Household and it is comparable to many contemporary writers of Bagley, including Jack Higgins, Hammond Innes, and Gavin Lyall. Desmond Bagley's published novels are: The Golden Keel (1962), High Citadel (1965), Wyatt's Hurricane (1966), Landslide (1967), The Vivero Letter (1968), The Spoilers (1969), Running Blind (1970), The Freedom Trap (1971), The Tightrope Men (1973), The Snow Tiger (1975), The Enemy (1977), Flyaway (1978), Bahama Crisis (1980), Windfall, (1982), Night of Error (1984), Juggernaut (1985). I stumbled across a new novel by Stephen Hunter that features Bob Lee Swagger. The title: Night of Thunder. It is scheduled for release September 23, 2008. Bob Lee is a Vietnam sniper who has had more trouble in this lifetime than anyone could possibly survive, but he always does survive and in an entertaining and exhilarating manner. There have been four novels to feature Bob Lee Swagger so far—Point of Impact, Black Light, Time to Hunt, and The 47th Samurai. The first three were written in the mid-to-late 1990s and The 47th Samurai was released last autumn, and truth be told I was a little disappointed. Mr. Hunter moved Bob Lee from the back country of the United States and sent him to Japan without his rifle to fight with swords. The plot was loose, the setting weak and as much as I wanted to, I couldn’t buy into it. 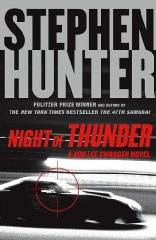 I hope Night of Thunder is a return to Swagger’s good old stuff: the kind of thrillers that really do thrill with likable and believable (somewhat) characters, and larger-than-life problems that really can keep you up all night. And the rifle. I hope it is in Night of Thunder a bit more than the last one. I hope. I discovered a new television series yesterday. It isn’t currently in production, but it is new to me. 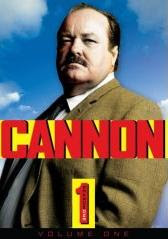 It stars William Conrad—the guy I clearly remember from Jake and the Fatman (he was the Fatman)—and it was produced from 1971 to 1976; according to IMDB there were 120 episodes. The title: Cannon. Frank Cannon is a former cop turned private eye who is esteemed as one of the best and most expensive in Southern California. He loves food, and amazingly does his own leg work, most of it in a gigantic Lincoln Continental. He talks to the witnesses, scouts the locations and gets thumped once or twice an episode doing one or the other. The storylines, of the few episodes I’ve watched so far, are top-notch. The mystery is intriguing, the action solid, and it is cemented together with a good deal of humor. The amazing thing—besides Cannon being a terrific show—is that each episode runs about 50 minutes; a little better than the 38 to 43 minute shams the networks are producing today. The shows that demand TiVO to watch without cursing the advertisers and producers, no matter how good it is. Was that a rant? 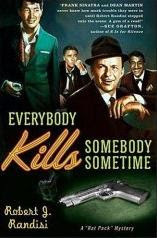 I've sold film rights to my first Rat Pack book, EVERYBODY KILLS SOMEBODY SOMETIME, to Sandy Hackett, the late Buddy Hackett's son. I will be writing the screenplay. Plans are to begin filming January 2010. Sandy Hackett will star as Sands Casino pit boss Eddie G., who in the story is asked by Frank Sinatra to help find out who is sending Dean Martin threatening notes, while they are filming Ocean's 11 in 1960 Las Vegas. All of the Rat Pack members appear in the book, as well as other historical characters like Sands boss Jack Entratter, George Raft and Angie Dickinson. This book was followed last year by LUCK BE A LADY, DON'T DIE, and in December HEY THERE (YOU WITH THE GUN IN YOUR HAND) will be published. All the books come from St.Martin's Press, and I'm presently working on the fourth, YOU'RE NOBODY TIL SOMEBODY KILLS YOU. I’ve read both of Randisi’s Rat Pack novels and I think each would translate well to film. You can read the Gravetapping review of Luck Be a Lady, Don’t Die Here, and a shorter review of Everybody Kills Somebody Sometime Here. Also, Randisi has a new Western out from Leisure Books titled Double the Bounty. I’ve seen it at a couple of different locations—Barnes & Noble and a local grocery store—so I know it’s available and the cover art is pretty good, but the newer Western releases from the large New York houses have been improving—beautiful scenery with a real western flair that really makes me excited to dip into the action and story inside. It’s probably not a secret to my regular readers, but I enjoy the work of Don Pendelton— his original The Executioner novels as well as his Joe Copp series—and I’ve been “rediscovering” his work over the past few months and I have enjoyed every minute of it. While I was cruising around Google a few days ago I came across his obituary in the New York Times. The author credits DP with the creation of a genre (a notion I share) and goes on to say that without Don Pendelton there would be no Rambo, or any of the other super hero types from 1980s film and literature. The Rambo comparison intrigued me because the film and novel are very different. I can see a clear correlation with the Stallone film, but the David Morrell novel is less clear. 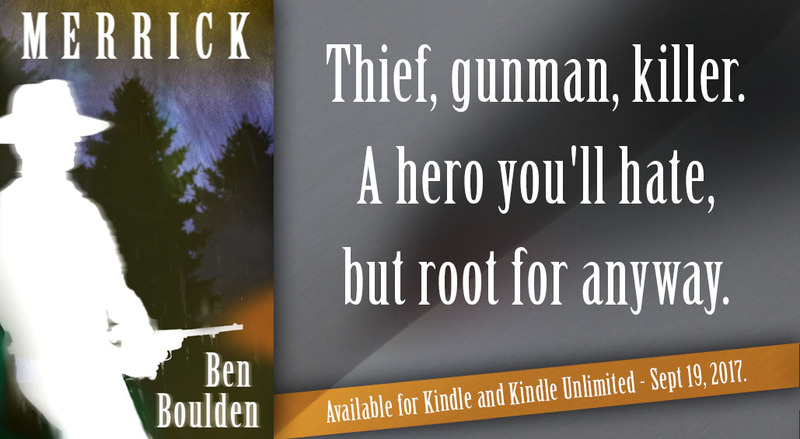 The hero does not fit the super hero mold, and the novel, while firmly in the action thriller category, is much darker and more realistic (than the Mack Bolan books) with both emotion and turmoil. You’ll notice the paper misspelled the last name of Mack Bolan. 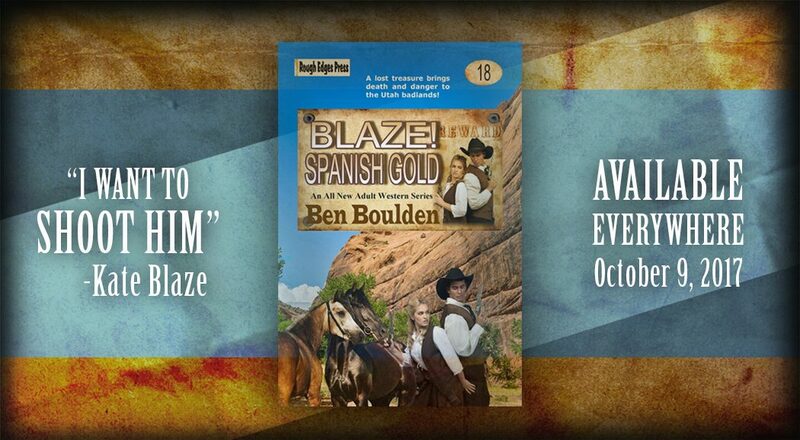 Don Pendleton, whose "Executioner" series featuring Mack Boland spawned the paperback genre of men's action-adventure novels, died on Monday at his home in Sedona, Ariz. He was 67. His wife, Linda, said the cause was a heart attack. In the beginning there were westerns, mysteries and science fiction. But until Mr. Pendleton, a onetime air traffic controller, brought Mack Boland to unlikely literary life in 1969, there was no action-adventure category, in which a lone, well-armed fantasy hero wreaks unremitting havoc on the forces of evil in modern society. Within a decade of Boland's first appearance, the action-adventure genre was a publishing phenomenon, for a while rivaling if not eclipsing its women's counterpart, romance novels. Indeed, a 1988 survey found a total of 66 separate action-adventure series in print. But the genre has been in a sharp decline recently, and only a half-dozen or so survive, "The Executioner" among them.